Looking for affordable, convenient motel accommodation in Glenelg? The Buffalo Motor Inn is ideally situated in the seaside suburb of Glenelg--well known for its sandy white beach and stunning sunsets, its vibrant seven-day shopping precinct and its array of impressive gastronomic delights. It is the perfect motel accommodation location in Glenelg, for an overnight stay, a fun-filled holiday or just a weekend getaway.The motel accommodation is within easy access to everything--from beaches to the hills, with the Adelaide airport only 10 minutes away and Adelaide's central business district 20 minutes away. Our friendly staff will be only too happy to assist you with local knowledge and will ensure that your stay is relaxing and enjoyable. You may wish to make an Enquiry, or Book Now to guarantee your accommodation. 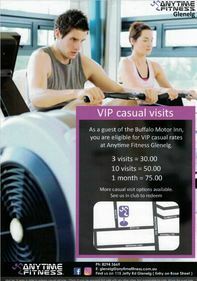 As a guest of the Buffalo Motor Inn, you are eligible for VIP casual rates at Anytime Fitness Glenelg. See our friendly Reception Team Member for more information when checking in.